Enbridge Energy has applied to build the largest oil pipeline yet from western North Dakota’s booming oil patch and will soon begin courting oil producers to reserve space, a key step in a $2.6 billion project that would move millions of gallons of oil to Minnesota and Superior, Wis.
Enbridge Energy, based in Calgary, Alberta, is proposing the 612-mile Sandpiper pipeline to carry 225,000 barrels of oil each day to a hub in northern Minnesota and 375,000 barrels to one in northwestern Wisconsin. If approved by regulators, it would be the largest pipeline moving oil out of North Dakota, the nation’s second-leading producer of oil behind Texas. North Dakota has more than doubled its oil production in the past two years, closing in on a million barrels of oil a day. But because of the lack of pipeline capacity in the state, about 60% of the state’s daily oil production is being shipped by rail. A barrel is equivalent to 42 gallons. Oil shipped to Superior would be shipped through Wisconsin on a network of pipelines already in place. Enbridge Energy has proposed an expansion that would not add pipe in the state, but would expand pump stations to allow more oil to flow through the Wisconsin pipelines. If it is approved, the two-phase expansion project for Wisconsin entails construction or upgrades at 13 Wisconsin pumping stations, along with three in Illinois, that would permit the pipeline from Superior to Illinois to triple its capacity to 1.2 million barrels a day from 400,000 barrels a day. Enbridge Energy operates about 50,000 miles of pipelines in North America, and several hundred miles of pipelines in North Dakota, including one that runs between Minot, N.D., and Clearbrook, Minn. The line, built in 1962, has the capacity to ship 210,000 barrels of North Dakota crude daily, or about 8.8 million gallons. Kinder Morgan Energy Partners is adding 18 miles of lateral pipeline in the Eagle Ford Shale. Kinder Morgan’s pipeline extension will carry crude and condensate from its DeWitt County, Texas station to a new facility it will build northwest in Gonzales County. The company’s $74 million pipeline addition would allow it to reach markets along the Houston Ship Channel and a pipeline that services a Phillips 66 refinery in Brazoria County. Kinder Morgan said Wednesday it struck a deal with a large producer in the Eagle Ford to extend the 178-mile pipeline in the South Texas shale play, but did not disclose the company. The expansion provides “much needed optionality to Eagle Ford producers and Houston market consumers,” said Don Lindley, Kinder Morgan’s president for natural gas liquids business development, in a written statement. The new pipeline will be able to transport 300,000 barrels of oil equivalent per day to the new station in Gonzalez County, which will have 300,000 barrels of storage capacity, a pipeline pump station and truck offloading facilities. It’s a drop in the bucket for the Houston pipeline operator, which currently plans to invest $900 million in Eagle Ford projects and joint ventures. Kinder Morgan’s general partner, Kinder Morgan Inc., owns the largest pipeline network in North America at 80,000 miles, according to data compiled by Bloomberg. Earlier this year, Kinder Morgan said it would expand another pipeline 31 miles from the DeWitt Station to a ConocoPhillips facility in Karnes County. That investment would amount to $107 million. 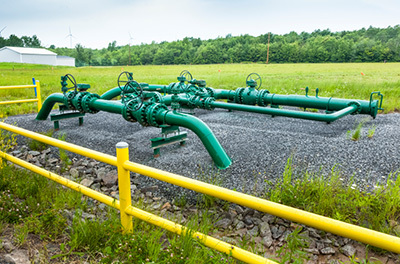 Utica Shale News: A Columbia Gas sister company released plans to build a 38-mile pipeline that will transport natural gas liquids from Ohio’s Utica shale. Pennant Midstream said the pipeline will connect the Hickory Bend processing plant in Mahoning County to the Utica East Ohio Kensington plant in Columbiana County. It will cost about $60 million and have the capacity to deliver 90,000 barrels per day. This is one of several projects in northeastern Ohio that will provide ways to get natural gas liquids such as ethane and propane to market. The liquids have a wide array of uses; among them, ethane is a key ingredient in chemical manufacturing, and propane is a fuel for home heating. The liquids often need a dedicated pipeline, the construction of which is an important part of developing the Utica, said Ben Ebenhack, associate professor of petroleum engineering at Marietta College. The Utica is rich in liquids, which is helping to drive much of the investment there. While the market price of natural gas has been low for several years, the liquids sell for a much higher price. Pennant Midstream is operated and co-owned by a subsidiary of NiSource, which is the Indiana-based parent company of Columbia Gas of Ohio. “The construction of new infrastructure is critical to unlocking the potential of the Utica shale play in Ohio,” Jimmy Staton, Columbia Pipeline Group and NiSource Midstream Services CEO, said in a statement. Construction has already begun on the project, with plans to finish by July. As the first natural gas well at Texas Motor Speedway was being drilled Tuesday, Hideki Makihara was more than a casual observer. Natural Gas is at a premium explained the Japanese lawmaker since Japan shut down its last nuclear reactor last week, a casualty of the Fukushima disaster in 2011. Since then, he said, electricity prices have doubled and Japan is paying some of the highest prices in the world for the natural gas needed to fuel its remaining power plants. Natural gas that will eventually flow from Quicksilver Resources wells at the giant racetrack in far north Fort Worth should contribute to the surge in U.S. gas production, which has driven down prices domestically and could eventually provide relief for Japan. Makihara, a member of Japan’s House of Representatives, on Tuesday visited Quicksilver’s drill site on the north side of Texas Motor Speedway, where the Fort Worth-based producer started drilling this month. Quicksilver holds the lease on the 1,450-acre property, as well as on much of the neighboring Alliance development. Quicksilver plans five wells at the current drill site on the edge of the racetrack’s sprawling parking lot, plus two additional drill sites on the west side with similar numbers of wells planned. It will also drill under the speedway from the east side of Interstate 35, something it did when it drilled at Alliance Airport, said Steve Lindsey, Quicksilver’s head of government and community affairs. But race fans won’t see any rigs at the speedway next month. Drilling will cease and the rig will be moved for the race weekend starting in late October, Lindsey said. The shutdown of nuclear power plants after the tsunami disaster is costing Japan billions. Japan’s industry ministry has estimated that the nation’s cost to import extra coal, gas and oil to run its non-nuclear plants will hit $93 billion by the end of 2013. The crisis sent Japanese energy interests looking to the U.S. for solutions. In March, Tokyo Gas, Japan’s biggest natural gas utility and a diversified global energy company, bought a 25 percent stake in Quicksilver’s Barnett Shale holdings, including the speedway land. Makihara was accompanied by Koji Yoshizaki, general manager of of Tokyo Gas America, based in Houston. Tokyo Gas has also agreed to buy liquefied natural gas from a planned terminal in Maryland that recently won an export license from the federal government. And the utility continues to seek production in the United States, Yoshizaki said. Under an agreement reached in 2008, the Fort Worth Sports Authority and the speedway will share royalties from production on the property, with much of the money going toward improvements at the facility. PVR Partners LP, an Eastern Pennsylvania midstream company, is teaming with Hess Corp. (NYSE: HES) as it expands into the Utica Shale play in eastern Ohio. PVR (NYSE: PVR) has been tapped to build, own and operate a 45-mile natural gas trunkline and gathering pipelines and facilities for Hess. The company is expected to have a total capital investment of between $125 million to $150 million. The project should be online in late 2014, according to a statement from PVR. The project consists of a minimum 20-inch diameter trunk line with anticipated minimum capacity of 450 million cubic feet per day and connections with the Texas Eastern and Rockies Express interstate pipelines, according to PVR. Additional connections could also be added to other interstate pipelines. The project also includes constructing compression stations, dehydration and other facilities. PVR is expected to invest $10 million in this project during the rest of 2013 and another $50 million during the first half of 2014. An additional $50 million will be invested in the second half of 2014 and the remainder in 2015, according to the company. This is great news for the Utica Shale region with this natural gas pipeline. However, there is a large responsibility for pipeline safety, cathodic protection management and more. MATCOR, Inc. is a leading cathodic protection and corrosion prevention engineering design firm, providing environmentally beneficial systems and services to global clients for nearly 40 years. An ISO 9001:2008 certified expert in the field of cathodic protection, MATCOR offers proprietary corrosion protection design, engineering, manufacturing, installation, cathodic protection testing, annual surveys, maintenance and complete corrosion protection project management. We specialize in protecting the infrastructure of the oil and gas, utility, transportation and construction industries. Worldwide Energy Consortium, Inc. (WEC) announced it will begin the initial Engineering/Permitting phase for its new refinery located near Gardendale in La Salle County Texas. The site was chosen to take advantage of the oil production from the Eagle Ford Shale play, considered to be one of the largest Oil and Gas fields in the world. This is the first of several planned operations by WEC in the region. Working closely with local officials, producers, land owners, and state agencies, WEC has identified multiple production sites that will allow it to take advantage of the abundant resources being developed in the area. This first project, The Whitetail Refinery, will begin immediately. The facility is expected to be operational by the last quarter of 2014. “The rapid deployment of modern, cost efficient refining operations directly into the new production regions will positively impact the producers, consumers, and the investors in our projects.” – Dave Martinelli, CEO Worldwide Energy Consortium, Inc.
MATCOR is a leading provider of ISO 9001:2008-certified cathodic protection products that project many refineries within the Eagle Ford Shale play. Learn more about our services and cathodic protection installation that carry a 10 year guarantee. MATCOR offers the latest insights on anodes for cathodic protection, cathodic protection equipment and more.